My weeklong solo trip to northwest Argentina was a cultural odyssey, revealing a new Argentina for me, a Spanish colonial lifestyle very different than that of the more hectic, fast-paced urban world of Buenos Aires. The language and accent were noticeably Argentinian, yet also included various indigenous dialects like Quechua. There were many differences in food, clothing, architecture, natural diversity of mountains and valleys, music, the cities and provinces of Salta and Jujuy (Hu-hu-y). These differences shaped my time there into a beautiful week and another possible destination to invite American travelers to add to their list of “Places to see in Argentina.” So rich was my week that I am writing about each destination in a separate post. This post focuses on my time visiting Jujuy and the towns along the “Quebrada de Humahuaca”. In the previous post I wrote about “la vida Salteña”. Check them both out. Climbing and climbing more! The capital city of the Province of Jujuy (Hu-hú-y), formally known as San Salvador de Jujuy, and simply referred to as Jujuy sits at 4,130 feet above sea level and is the starting point for numerous daily excursions to the Quebrada de Humahuaca (9,311 ft.) and the salt flats known as Las Salinas Grandes (11,318 ft. above sea level), places I visited during my recent solo trip to the provinces and main cities of Salta and Jujuy. Salta is the focus of the previous post, and Jujuy is highlighted here. The Quebrada de Humahuaca or Humahuaca Ravine spans almost 80 miles and is a UNESCO World Heritage Site where the Spanish colonial lifestyle in this area is preserved. The town of Tilcara (the archeological capital of the area), along with the indigenous towns of Purmamarca, Tilcara and Humahuaca with their local artesans markets and beautiful mountain views, welcome tourists all year around. Jujuy feels more Bolivian than Argentinian, at least if measured by the merchants and restaurant staffs’ clothing, culture, foods and indigenous languages, alongside the mountains, valleys and ravines that extend north and west and boast thousands of years of existence among them! Along this majestic route through the mountains and valleys we passed the Tropic of Capricorn, one of the five major circles of latitude marked by maps of the earth, “La Paleta del Pintor” (the painter’s palette) colorful rock formation, and the famous Cerro de Siete Colores (the 7-colored mountain range/hill) that provide the amazing background settings for these simple villages. The main square in Purmamarca is filled daily by local artesans selling their handmade clothing and other articles. But when I visited Las Salinas Grandes, the 23,000 sq. miles of salt desert, located more than 13,000 ft. above sea level, with two new Argentinian friends, I realized how subjective our perspectives are. The well maintained, new national highway route 52 led our mini-van up via the serpentine two-lanes hugging the many switchbacks to the top, at 4,170 meters, or 13,681 feet. A thousand feet lower we sail into the Salinas themselves. Imagine an expanse of this desolate, unending white as far as you can see, a vision not unlike seeing frozen-over Lake Michigan from the Chicago skyline in wintertime, a fact that my late brother’s voice echoed in my consciousness. “And you paid how much to come all the way up here to see this?” he asked mockingly, laughing! All the while my Argentine travel buddies were in awe of the white desert, and they climbed the salt hills like kids playing in the new snowfall, while I laughed at my brothers’ wonderful sense of humor! They were fascinated; I, less so, but I am still appreciative that I actually have the chance to travel this far to see scenes like this that look similar but are quite different. The beauty of Jujuy is in the land, and also in her native people, whether singing for us as did the children we saw, or knitting beautiful handmade ponchos, sweaters, blankets, ceramics and hats. 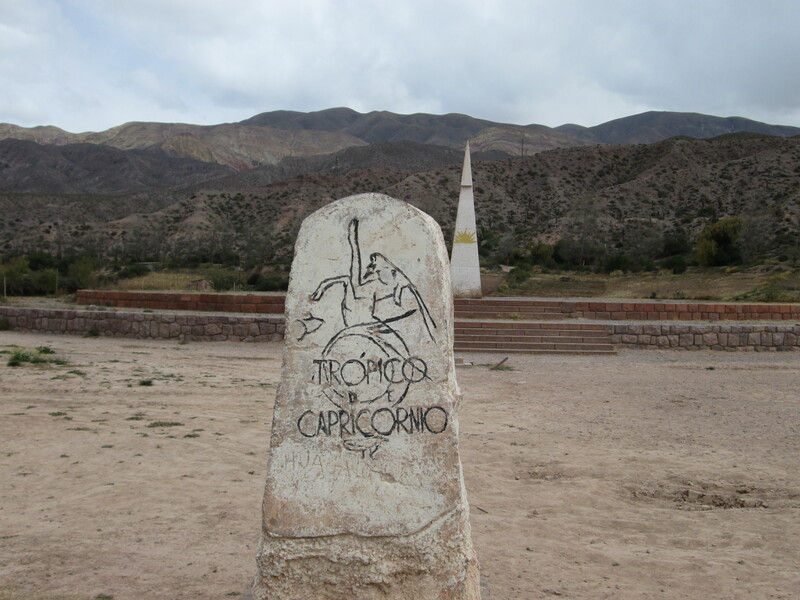 ALong the way we stopped at the Tropic of Capricorn, the southernmost latitude where the Sun can be seen directly overhead and where La Pachamama, the indigenous earth goddess of the indigenous Andian people, is worshiped. Viva Jujuy!Consider a side trip to Salta and Jujuy when you come travelling in Argentina. I’m glad I made the trip. Thanks Rita. Yes these are all my photos from the trip. It will be strange returning to a city without him there. He was a big presence in my life. I am eager to be with his sons and wife, as well as my siblings. Sorry to miss you too. I return June 27.